Sure, there hasn’t been a ton of surprising results in recent polls. Hillary Clinton remains the favorite in the presidential race with a 69 percent of winning, according to FiveThirtyEight’s polls-only model, and a 68 percent chance according to polls-plus. Still, the RABA Research poll in Iowa showing Donald Trump up by 1 percentage point and the Public Policy Polling survey in Nevada showing Clinton up by just 3 points are intriguing. These polls follow other surveys in these states showing a close race. Based on the demographics and previous voting patterns in Iowa and Nevada, they “should” be better states for Clinton. The polls component is simply the adjusted polling average. Before taking an average of the polls, the model basically makes them all apples to apples. It adjusts polls of registered voters and adults to be equivalent to likely voter polls. It adjusts polls that omit Gary Johnson to be equivalent to ones that include him. It makes a trend-line adjustment and accounts for house effects (for more detail, see here). The demographic regression (which you can read more about here) is based mostly on figuring out how each state “should” vote given its voting history in presidential elections, the region of the state and, to a lesser extent, the state’s demographics, such as race, religion and educational level. In most swing states at this point, the polls-only forecast blend is about 80 percent polling and 20 percent from the demographic regression. And in most states with a lot of polling, the difference between the polls and the demographics is minimal. 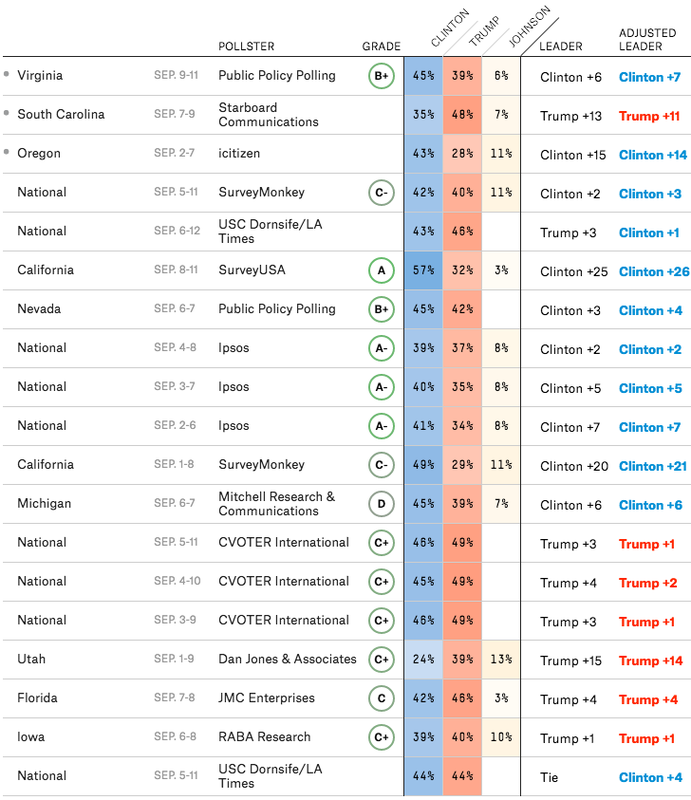 You can see this in the table below, which shows Clinton’s poll-based forecast margin and her demographic-regression-based margin over Trump in states in which at least three pollsters1 have released a survey since the Democratic convention. Only four of the 22 states surveyed by at least three pollsters have a difference of more than 4 percentage points. That is, the polls and the demographic forecasts line up fairly well. That shouldn’t be too surprising, given that the regression analysis was designed to match the polls to a large degree. Still, there are clear differences in four of the states that are worth diving into. Iowa — Why is Trump beating the demographics here? Well, whites without a college degree in Iowa were abandoning the Democratic Party before Trump. Before 2014, whites with and without a college degree tended to vote similarly in Iowa. But in the state’s 2014 U.S. Senate election, Democrat Bruce Braley did particularly poorly among whites without a degree. Further, according to Gallup, Obama’s approval rating and the Democratic advantage in party identification declined more steeply in Iowa in 2014 than it did in the nation. So noncollege whites in Iowa were already trending towards the GOP. Then comes Trump, who has outperformed with that group relative to other Republican presidential nominees. Those two trends together might give Trump an advantage in the Hawkeye State not reflected in its recent presidential voting history. Kansas — Clinton isn’t making a play here, and Trump will likely carry the state. But Trump is probably going to do worse in Kansas than Romney did. Part of Trump’s lack of appeal could stem from local Republican problems. Despite an overwhelming advantage in party registration, polling indicates that voters blame Republicans (not Obama) for the state’s economic problems. Or, maybe Trump’s brashness doesn’t play well in this Midwest state where he lost the Republican caucuses. Trump’s favorable rating was lower than Obama’s in Kansas, according to a recent SurveyUSA poll. One note of caution: Although Gov. Sam Brownback and Sen. Pat Roberts, both Republicans, struggled to win re-election in 2014, the polling underestimated their strength two years ago. That may be happening again — the demographic regression could be closer to the mark. Nevada — There are probably a few factors at play in Nevada that are giving Trump a chance. The first is Nevada’s economy, which is still feeling the lingering effects of the Great Recession in ways other states haven’t. Our demographic model accounts for the health of each state’s economy, but it doesn’t weight it particularly heavily. Second, Trump is holding his own among whites with a college degree in Nevada in a way he isn’t in other states, while also doing very well among whites without a college degree (who make up a big part of the white vote in Nevada). The most recent Marist poll of Nevada, for example, found Trump to be winning college-educated whites by 6 percentage points, which is much better than he is doing nationally with them. Of course, it could be the case that the polls in Nevada are simply underestimating Clinton’s strength, as they did President Obama’s in 2012 and Democratic Sen. Harry Reid’s in 2010. Utah — As has been said over and over again, Trump is greatly underperforming Mitt Romney in Utah. Trump has spoken poorly about Romney, who is still beloved in the state. Trump’s rhetoric on immigration doesn’t appeal to Mormons. And while it sometimes gets lost in the shuffle, Utah’s white population is better educated than in most states. Although our model does take into account educational and religious factors, the distaste for Trump is so great (see his poor caucus performance) that it creates an even closer race in the state than might be expected. It’ll be interesting to see if these differences between the polls and the demographics continue to hold as we approach Election Day and if the polls end up capturing something that the demographics didn’t, or vice-versa. Don’t get too obsessed with the differences. Most state polling is lining up with the demographic projections. But the exceptions are worth keeping an eye on, particularly Iowa and Nevada. This does not include Google Consumer Survey or Ipsos, whose state polling we are down-weighting because previous polling using techniques like theirs has been less accurate than other statewide polling.